This vegetarian side dish has it all: outstanding flavour, bright colours, and the "wow" factor you want at a festive winter gathering. And if you're after a stress-free holiday, delegate the julienne peeling to a friend or family member. More time for you to focus on main dishes...or sip some cranberry gin! 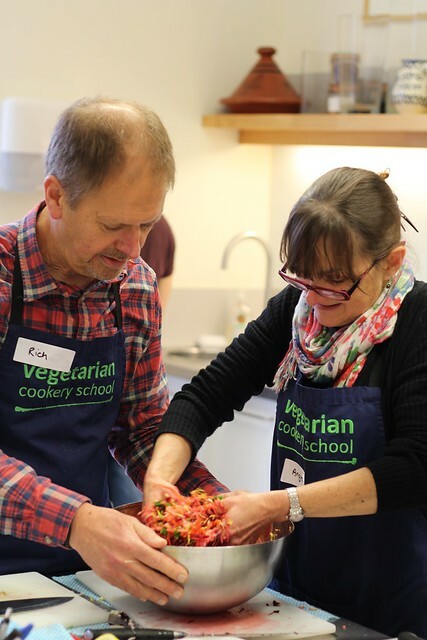 We've developed a number of new recipes this year, so keep an eye on our blog as well as upcoming classes. If you can't make our December Christmas classes, there's always the New Year! Hope to see you soon. To make the candied pecans ahead: Place the pecans, sugar and olive oil in a small non-stick frying pan. Just cover with water, then bring to the boil and simmer until all the water has gone and the nuts start to fry and caramelise. When golden sprinkle on the salt. Peel all the vegetables. Then use a julienne peeler to create strips and ridged slices out of the carrot, beetroot, celeriac, Jerusalem artichoke, and apple. Or use a grater or spiraliser. Strip the kale from the stem and tear into small pieces. Mix the lemon and salt in and massage the vegetables, scrunching with your hands until the vegetables have softened and released some juices. Stir in the dried cranberries, caraway, coriander and black pepper. Leave to sit for at least 30 minutes for the flavour to develop. Mix the dressing ingredients together and drizzle over the slaw just before serving. Sprinkle candied pecans on top to serve.